***Comprehensive list may not be all inclusive due to constant Research & Developments per manufacturer. We do all commercially available kits. For a complete list, please visit the Luminex site. Please contact the facility for specific kit information. Several companies offer kits for the multiplex detection for human, non-human primate, canine, porcine, mouse, and rat cytokines. They also offer a wide variety of ancillary and “general-purpose” reagents, including microspheres labeled with capture probes that specifically bind avidin (biotin), immunoglobulins (secondary antibodies and protein A/G), or common fusion protein tags (Ni2+ and glutathione). For example, Life Technologies offers “AKT Pathway Total 7-Plex” and “AKT Pathway Phospho 7-Plex” platforms, which are specifically designed for quantifying the total proteins: IR, IGF-1R, IRS-1, Akt, PRAS40, p70S6K, and GSK-3β or alternatively the phosphorylated proteins: IR[pYpY1162/1163], IGF-1R[pYpY1135/1136], IRS-1[pS312], Akt[pS473], PRAS40[pT246], p70S6K[pTpS421/424], and GSK-3β[pS9]. The Multiplexed Transcription Factor Profiling System allows researchers to identify proteins that drive biological responses. 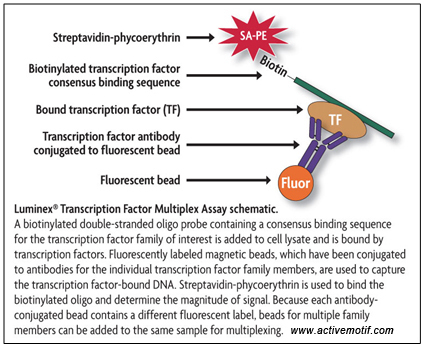 It employs a powerful multiplexing approach for simultaneously measuring the binding of many different transcription factors to their unique regulatory DNA elements. The technology dramatically accelerates studies ranging from basic research in signal transduction and proteomics to target validation, compound screening, toxicity testing and disease characterization. This innovative technology offers unique benefits to researchers studying gene regulation. Unlike conventional methods such as EMSAs, each assay measures the presence of multiple transcription factors simultaneously, allowing powerful comparisons of different cell lines and treatments. 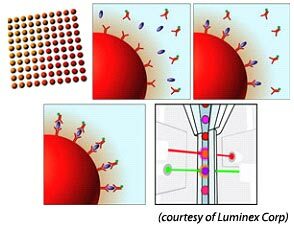 The QuantiGene Plex Assay is a hybridization-based assay using the xMAP® Luminex® magnetic beads and performed on 96-well plates. The assay is based on DIRECT quantification of the RNA targets using xMAP Luminex beads for multiplexing of 3 to 80 RNA targets and branched DNA (bDNA) signal amplification technology. On the first day, the sample is lysed to release the RNAs, and incubated overnight with target specific probe sets panel. On the second day, the signal amplification tree is built via sequential hybridization of PreAmplifier (PreAmp), Amplifier (Amp) and Label Probe (LP). Each amplification unit gives a 400 x signal amplification. and there are six amplification units per target RNA copy leaning to a 2,400 x signal amplification per copy RNA. The signal is detected by adding SAPE substrate and using a Luminex instrument for the read-out. More information on the QuantiGene Assay is available here.